Filmmaker Rel Dowell's highly reflective and absorbingly insightful documentary Where's Daddy? 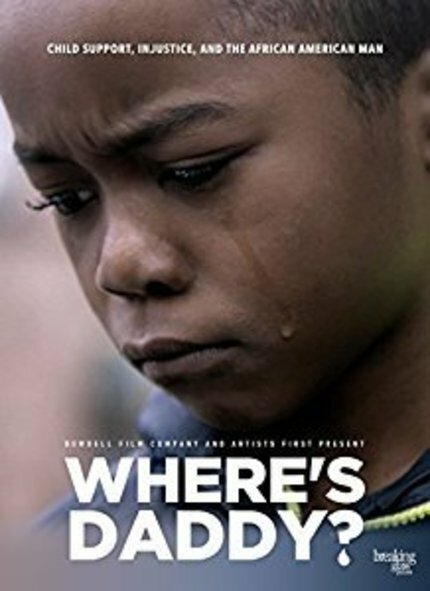 explores a societal epidemic that taps into the three areas that the film openly highlights in its marketing strategy: child support, injustice, and the African American man. Indeed, socially conscious-minded films about the pained realities of the Black Experience--particularly in struggling communities trying to cope with the daily strife both psychologically and financially--can hit hard to the disillusioned psyche. Nevertheless, writer-director Dowell offers a biting examination of how frustrated black men are handcuffed about the problematic child support system and the judgmental courts that may ineffectively cripple the process. Where's Daddy? is gripping and thought-provoking in its serious look at deprived families paying an ultimate price--particularly at the expense of the innocent children exposed to the complexities of the questionable politics of legal compromise and chaos for child support matters. The Philadelphia-bred Dowell ("Train Ride", "Changing the Game") delves into the severely flawed American child support landscape. The film's titular question begs to pinpoint the several conflicts that affect black fathers' means to properly provide for the kids that they cherish. The inference in Where's Daddy? is that these black fathers actually want to be there for their young ones. Any references to the term "deadbeat dad" does not fly right with these flustered men. The intended motive to do right by the overlooked children pertaining to child support and/or custody issues is admirable but the broken court system unfairly rears its ugly head. The suggestive hint of restrictions and inflexibilities that possibly hinder the cohesiveness of these daddies trying to hold their families together despite monetary misplacement is profoundly a continual roadblock that is quite difficult to overcome. Refreshingly, the tables are turned because the black men profiled in Dowell's observational exposition want to be instrumental in being the dependable provider for their vulnerable households. Thankfully, the familiarized stigma of absent black men purposely not wanting to shoulder any financial or emotional responsibility for the trail of children they willingly leave behind is not the focus in Dowell's well-executed expose. At the crossroads are the concerned fathers whose limited or lack of funds are strapped tight to the point that if the monthly payments are not paid timely it could inevitably spell incarceration for such a critical consequence. Sure, Dowell displays his version of a Catch 22 concerning this sticky dilemma acting as an engulfing penalty for the jailed fathers. Bottom line: a.) the men do not meet their obligation to make payment on the owed child support for whatever obstacle encountered b). the next step for this costly infraction is jailtime for whatever days ordered to serve and c.) the doomed fathers behind bars cannot make any money to pay the owed child support because...wait for it...they are behind bars! Some may see the logic at hand for how impactful it is for these stressed-out black fathers failing to pay up while locked away. Still, one cannot ignore the rationale regarding why these black men are in the pickle to begin with courtesy of not producing the child support in the first place. The film introduces the startling statistics for the alarming percentage of black men locked up for not meeting their financial obligations of child support for their offspring. There seems to be enough of a sob story for everyone involved besides the hampered prison-bound fathers. On the flip side of the coin are the embittered mothers/wives/girlfriends at home feeling the threatening pinch of no money coming in period. How can they hold down the fort when no funds are readily available to keep their needy children and themselves in check? The men are feeling the pressure to make payment despite unkind circumstances but their women are feeling the pressure in maintaining the upkeep for the kids due to the absence of money. The tug-of-war of hurt feelings are tossed around but the children's welfare is at stake. For the most part, Dowell conducts some penetrating interviews from those connected to the complicated childcare system fiasco. In addition to getting the hard luck-sounding feedback from the disoriented men and their weary women tending to the jeopardized children we also hear from an assortment of lawyers, professors, prisoners, and court advocates that chime in on the puzzzling discussion. From notable faces such as hip hop artist Freeway to a derelict dad living out of his cluttered truck Dowell does not miss an unturned stone as far as seeking relevatory responses from his opinonated mouthpieces. Where's Daddy? meticulously covers its vast ground in having Dowell's various talking heads (and the sentimental consideration pertaining to all its victimized youngsters) contribute to the important conversation at large. Fittingly, it is a vicious circle and plenty of fingers could be pointed at the terminally twisted knots that need unraveling in the so-called injustices that prevent conscientious jailed black fathers from dutifully paying monthly child support for the children they brought into the unprepared world. Dowell's documentary will beg the audience to also visit the lingering behind-the-scenes reasoning for the child care system burdens that exist. For instance, why would the overwhelmed black men spotlighted even bother to make babies (whether by one woman or several women at the time) knowing full well that they may not be able to support them? Plus, why would some of these women be susceptible to having kids with unsure men that are not stable enough as breadwinners? The understanding is that the child support/custody care contamination is unnerving but the tainted individuals tangled up in this messy mishap are not exactly exempt from this whole kiddie-concerning quagmire either. As with some documentaries raising more questions than it can answer, the absorbing Where's Daddy? certainly purports to forwarding an idealistic curiosity in bothering to contemplate this on-going perplexing predicament. Unfortunately, the answers do not come easy for the imprisoned black men and their equally imprisoned fractured families looking for rescued solutions to materialize at the heels of the checkered childcare abyss at bay. black fatherschild care systemchild supportdocumentaryRel DowellWhere's Daddy?